Southern Africa produces almost a third of the Earth’s biomass burning (BB) aerosol particles, yet the fate of these particles and their influence on regional and global climate is poorly understood. ORACLES (ObseRvations of Aerosols above CLouds and their intEractionS) is a five year investigation with three Intensive Observation Periods (IOP) designed to study key processes that determine the climate impacts of African BB aerosols. Particles lofted into the mid-troposphere are transported westward over the SE Atlantic, home to one of the three permanent subtropical Stratocumulus (Sc) cloud decks in the world. The stratocumulus “climate radiators” are critical to the regional and global climate system. They interact with dense layers of BB aerosols that initially overlay the cloud deck, but later subside and are mixed into the clouds. These interactions include adjustments to aerosol-induced solar heating and microphysical effects. As emphasized in the latest IPCC report, the global representation of these aerosol-cloud interaction processes in climate models is the largest uncertainty in estimates of future climate. The ORACLES experiment provides multi-year airborne observations over the complete vertical column of the key parameters that drive aerosol-cloud interactions in the SE Atlantic, an area with some of the largest inter-model differences in aerosol forcing assessments on the planet. Composite CALIPSO lidar backscatter curtains show pervasive transport of BB aerosol transport during the first week of September 2008 as well as the underlying cloud tops. 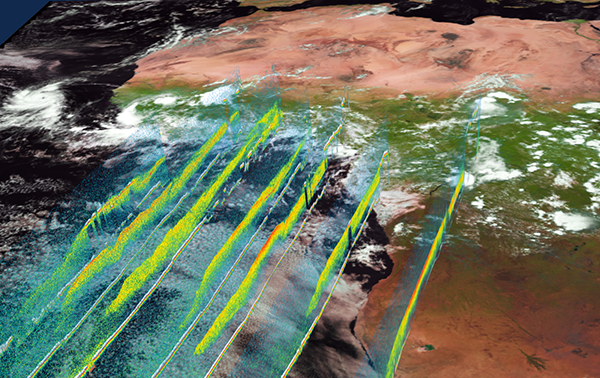 Determine the impact of African BB aerosol on cloud properties and the radiation balance over the South Atlantic, using state of the art in situ and remote sensing instruments to generate data sets that can also be used to verify and refine current and future observation methods. Acquire a process-level understanding of aerosol-cloud-radiation interactions and resulting cloud adjustments that can be applied in global models.